Horseshoe Canyon, previously known as Barrier Canyon, is a very special place. It’s also the location where Barrier Canyon Style rock art derived it’s name from. 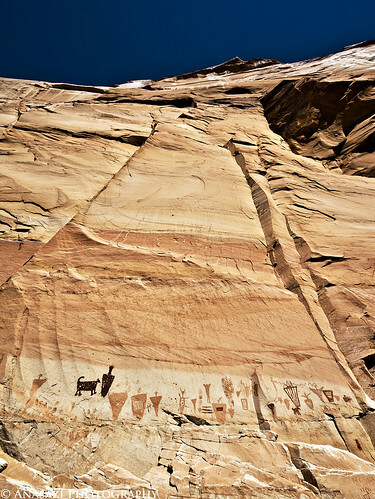 There are many pictograph panels located in this canyon including the famous Great Gallery. From the main trailhead you will pass the Horseshoe Gallery on your way to the Great Gallery. While this panel might not be as large or as detailed as Great Gallery, I find it very striking. I think it might be because many of the figures seem to be purposely painted on the lighter horizontal stripe of the canyon wall, which helps to frame them.